This picture gives you some idea of the size and weight of the box. 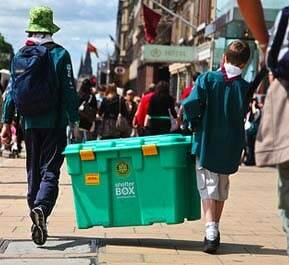 While doing some research on disasters in third world countries, I came across something called a Shelterbox. 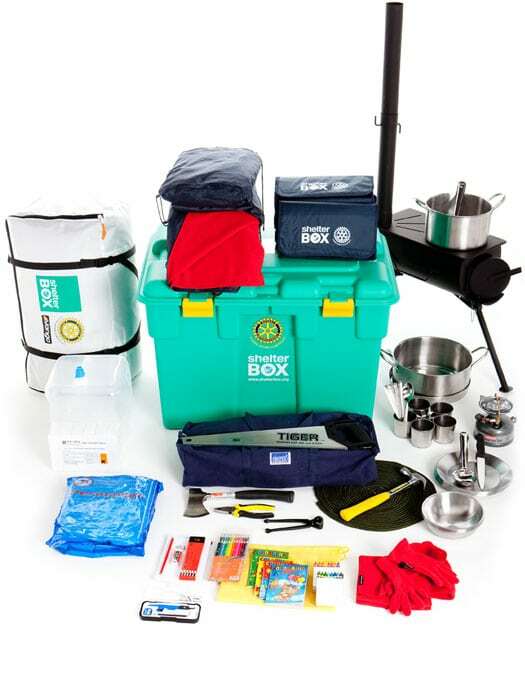 This is a box containing a shelter and assorted items to provide heat and cooking facilities after a disaster. The charity that provides these to third world countries figure they cost one thousand dollars each including shipping and storage. While you cannot buy one already made up they have designed a nice compact package that would be very useful in a bug out situation or if you lost the use of your home. The box is quite compact and portable. All of the contents are readily available and with a little ingenuity could be customized to your area. The box contains the following items. What really appeals to me about the kits is that you have everything in one box that is ready to go. Add a few boxes with food and medical supplies and you load your vehicle and leave in short order. This entry was posted in cooking, earthquake, Shelter and tagged Howard, shelter, Shelterbox. Bookmark the permalink. I like that stove. Anybody know where to get an equivalent? sportsman guide has stoves like that. Below is a link for a woodstove. The stove in the picture is a woodstove not a liquid fuel stove. Actually there are two stoves in the picture, both a wood and a gas stove. How Ironic. I saw these in my office building yesterday. There was a CFC drive, trying to get donations for the project. The kit seems well made, and they have went through a lot of thought putting them together. All materials were quality, and it included a large Lifestraw (larger than the ones I have previously seen), that had a reservoir bucket and manual pump. The tent sleeps 10, and they have several thermal additions that can be added depending on the region. I asked the vendor, and he stated that there were several of these kits sent north of Joplin following the tornado that hit there in 2011. I understand this is an international effort, but I only wished more were distributed in the US. I’m sure the people up north could use these right now. Good post. I think everyone should have one of these, or at least the equivalent. these shelter boxes seem like a real good idea..
wonder if they couldn’t sell them “in general”, to raise funds to provide more in disaster situations?